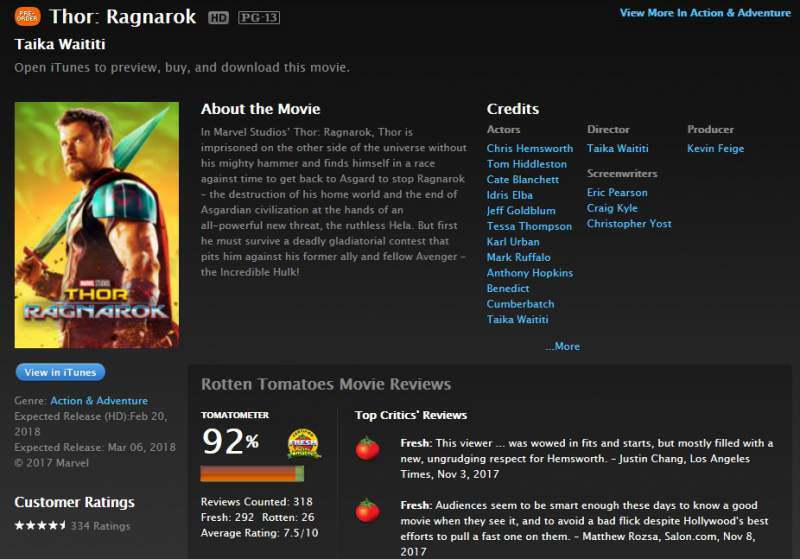 Pirates had a field day recently when the high-definition version of Marvel‘s Thor: Ragnarok leaked out a month early. The third installment from the series was originally slated for a February 20 release date. In fact if you search for it on iTunes it has a pre-order button available. However, when a reddit user ordered the movie through Vudu (which is linked to his iTunes account), the full movie already showed up in his library. Disney is surely expecting healthy sales for the digital copy considering it is one of the better Thor films yet. It also earned over $850.8 million in ticket sales worldwide while being the highest critically rated Thor movie. Naturally, it only took a few hours for pirates to take advantage of the situation. Soon, 720p and 1080p HD copies of the movie surfaced on various websites. Naturally, stripped of its DRM. Although it is not exactly clear how the mistake even happened, but it appears to involve the Movies Anywhere platform. This service allows users to link various accounts into a single video library. Disney owns Movies Anywhere, so the mixup which caused the leak is on their end as well. Disney, Vudu, and iTunes have yet to comment on the leak, however the pre-order function on iTunes is now back to normal.